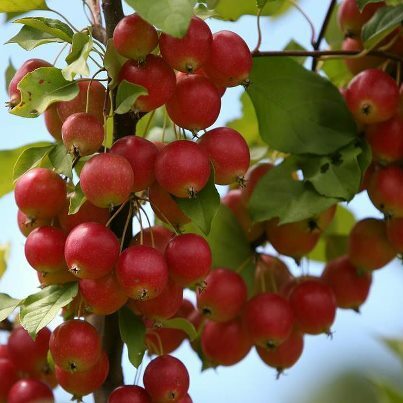 Yesterday as I pedaled my bike past some woods, I saw hanging low a branch full of beautiful little crab apples sticking out from among the trees. I stopped and pulled off a pocketful which I took home and cooked up. The little pocketful made only about half a cup of jam, but the taste is fantastic. While I was cooking that up, I listened to a WHYY TedTalk about a fish farm in SW Spain which is in a wetland where 20% of the fish get eaten by wild birds. It is a sustainable ecosystem and the fish taste far better than domestic farmed fish. And the farmers never have to feed the fish and they get enough to maintain a healthy industry for themselves. I imagine the birds fertilize the phytoplankton that the fish feed on, and it all balances out. It sounds like an organic permaculture veggie farm with chickens cleaning out the bugs while fertilizing the soil. The speaker pointed out that while people tend to think this kind of balanced farming needs to be small, it is not size that matters. Keeping the healthy ecosystem in balance is the key. Story courtesy of Rita Varley.